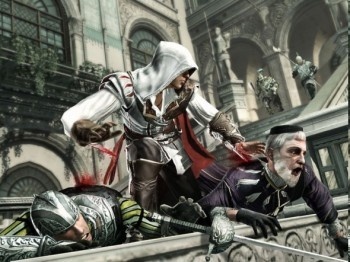 A German gaming magazine says Ubisoft demanded it give Assassins Creed 2 top marks or their review copy would be kaput. According the German gaming publication Computer Bild Spiele, Ubisoft would only release an early review copy of Assassins Creed 2 if the magazine agreed to give the game its highest grade, "sehr gut" or "very good" in German. The magazine refused and audaciously decided to tell their customers about it as you can see in this poorly translated editor's note. Computer Bild Spiele plans to review the game only after it has been officially released. It's important to note that we only have the word of Computer Bild Spiele that this was in fact how it went down. If it is true though, it might make customers in this country more apprehensive about the quality of the game than a potential bad review in a German games magazine. A studio with any intelligence in its marketing department is wary of receiving unfavorable early reviews, as that kind of press can quickly kill a game. Attempting to insure that the magazine publishes a good review, however, is a poor solution. One would think that the publishers would believe that the merits of a game like Assassins Creed 2 could stand on its own. It is unfortunate, but this kind of backroom deal happens often between game publishers and reviewers. For the record, it is policy at The Escapist to never accept any compensation for editorial coverage. Unless it's cookies. We love cookies.